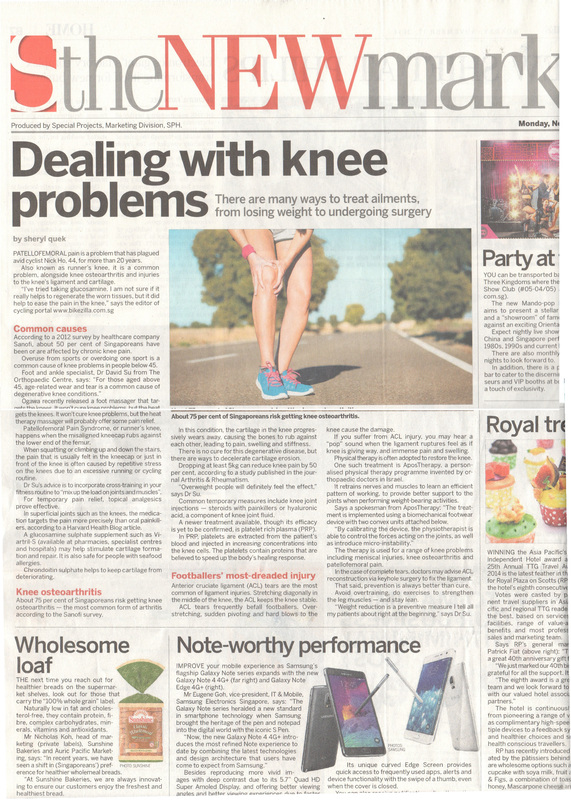 Dr David Su shares with Sheryl Quek, from The Straits Times, the common causes of chronic knee pain and other knee problems like knee osteoathritis and ACL tears. Chronic knee pain for people below 45 is commonly caused by overdoing and overuse from sports. As for those above 45, the common cause is age-related wear and tear leading to degenerative knee conditions. Three common knee pain problems are Patellofemoral Pain Syndrome (runner’s knee), knee osteoarthritis and knee ligament and cartilage injuries. Runner’s knee happens when the kneecap is misaligned and rubs against the lower end of the femur. This is often caused by repetitive stress on the knees due to an excessive running or cycling routine. Dr David Su recommended that runners incorporate cross-training in their fitness routine to get a good mix of load on joints and muscles. Some supplements can help to stimulate the formation and repair of the cartilage or keep it from deteriorating. Knee osteoarthritis, which is the wearing away of the knee cartilage, is the most common form of knee arthritis. There is no cure for this degenerative disease but there are ways to decelerate the cartilage erosion. Shedding 5kg of weight, especially for those who are overweight, can reduce knee pain by 50%. Knee joint injections like hyaluronic acid and platelet rich plasma (PRP) therapy are common temporary measures as well. Anterior cruciate ligament (ACL) tear is the most common ligament injury, especially for soccer players. Physical therapy is often used to restore the knee. However, orthopaedic specialists may advise for ACL reconstruction in the case of complete ACL tears.